Product prices and availability are accurate as of 2019-04-25 04:01:30 UTC and are subject to change. Any price and availability information displayed on http://www.amazon.com/ at the time of purchase will apply to the purchase of this product. The Vastar Pet Seatbelt is designed to answer every dog owner's prayer - protect your pet, keeping him/her in the back seat, and away from the center console while you drive. High value shouldn't compromise safety when it comes to taking care of your furry friend. It is made of high quality nylon fabric to ensure safety, compared with the old version, Vastar pet seatbelt features the solid zinc alloy swivel snap and metal buckles to guarantee extra durability. Simply clip the Pet Seatbelt onto your pet harness and snap the belt tab right into the seat belt receptacle of your vehicle, securing your pet into place (Note: The tab on the seatbelt clip is 2cm, please check your buckle's size and compatibility before purchase). With an adjustable length, the Pet Seatbelt accommodates dogs both small and large. Give your pet the freedom to sit, lay down, or stand freely without endangering the driver with distractions. Made of high quality nylon fabric to ensure safety, features the solid zinc alloy swivel snap and metal buckles guarantee extra durability. Hassle-free seatbelt clip designed to latch into your car with ease. 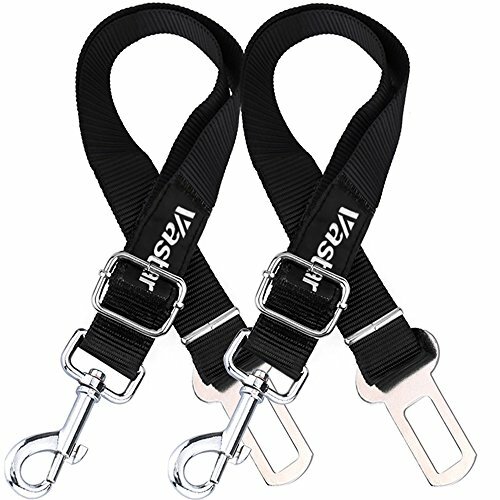 Universal clip for any pet harness you may own Accommodates dogs both small and large with an adjustable length : 16-27in (42-68cm) in length, 1in(2.5cm) in width Keep your pet safely restrained and secure in vehicle while driving, and allows your dog to sit, stand or lie down comfortably in a car without distracting the driver.